When I debate class warfare issues, here’s something that happens with depressing regularity. I’ll cite research from a group like the Tax Foundation on how an overwhelming share of the income tax is borne by upper-income taxpayers. The statist I’m arguing with will then scoff and say the Tax Foundation is biased, thus implying that I’m sharing bogus data. I’ll then respond that the group has a very good reputation and that their analysis is directly based on IRS data, but I may as well be talking to a brick wall. It seems leftists immediately close their minds if information doesn’t come directly from a group that they like. 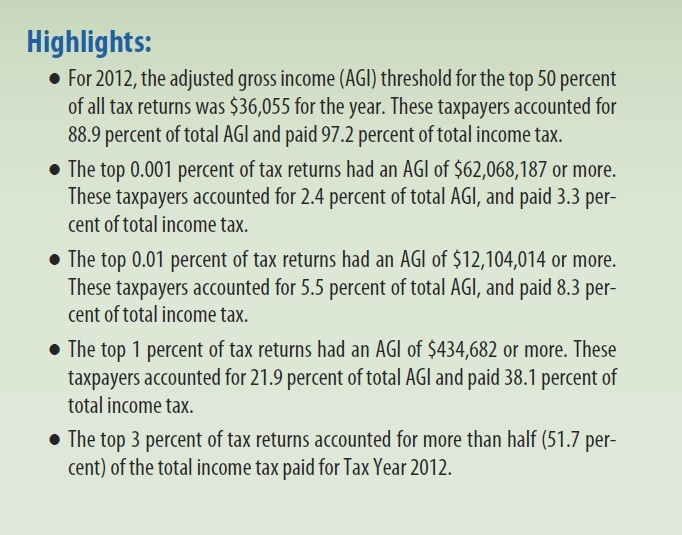 So I was rather happy to see that the Internal Revenue Service, in the Spring 2015 Statistics of Income Bulletin, published a bunch of data on how much of the income tax is paid by different types of taxpayers. I’ll be very curious to see how they respond when I point out that their favorite government agency admits that the bottom 50 percent of earners only pay 2.8 percent of all income tax. And I’ll be every more curious to see how they react when I point out that more than half of all income taxes are paid by the top 3 percent of taxpayers. This doesn’t mean, by the way, that the debate about policy will be settled. Getting statists to accept certain facts is just the first step. But once that happens, we can at least hope that their minds will be opened to subsequent steps, such as understanding the economic impact of punitive tax rates, recognizing that high tax rates won’t necessarily collect more revenue, or realizing that ordinary workers suffer when harsh tax policies reduce economic vitality. Though I’m not holding my breath and expecting miracles. After all, some leftists openly state that they don’t care if the economic damage of high tax rates is so significant that government doesn’t collect any tax revenue. You can see an example of one of these spite-motivated people at the 4:20 mark of the video I narrated on class-warfare taxation. P.S. Shifting to another tax topic, some of you may have heard about the massive data breach at the IRS. Here’s some of what CNN is reporting. The Internal Revenue Service believes that a major cyber breach that allowed criminals to steal the tax returns of more than 100,000 people originated in Russia, Rep. Peter Roskam confirmed to CNN on Thursday. …The IRS announced Tuesday that organized crime syndicates used personal data obtained elsewhere to access tax information, which they then used to file $50 million in fraudulent tax refunds. I suppose I could use this opportunity to take a few potshots at the IRS, but there’s a far more important issue to raise. I’m guessing the IRS probably has the best computer security of any tax bureaucracy in the world. Yet even all the IRS’s expertise couldn’t stop hackers from obtaining sensitive information. Now let’s contemplate something truly frightening. The Obama Administration wants the United States to be part of an OECD pact that obligates participating nations to promiscuously share information with dozens of other governments, including untrustworthy, hostile, and/or corrupt regimes such as Russia and China, not to mention make information available to jurisdictions that presumably will have very little technical capacity to guard data from hackers and identity thieves. Here’s the list of participating nations on the OECD website, and it includes Azerbaijan, Cameroon, Greece, Indonesia, Mexico, Nigeria, Romania, Saudi Arabia, and Ukraine. Yet none of this reckless endangerment would be an issue if we had a simple territorial tax system like the flat tax. Under such a simple and fair system, only income inside America’s borders would be taxed (unlike the wretched system of worldwide taxation we have now), so there would be no need to have risky information-swapping deals with dodgy foreign governments. P.P.S. Senator Rand Paul is one of the few lawmakers fighting to protect Americans from having their information shared with foreign governments. P.P.P.S. Shifting back to the original topic of class-warfare taxation, here’s a lesson on the Laffer Curve I offered to President Obama. Reblogged this on Daňová sebeobrana podnikatele. As long as we have “representatives” who represent their own interests over the interests of Freedom and of the People, the Theft of the American Tax Dollar will never cease. As a matter of fact, it will only increase. I see only one of two ways out…either we get a Constitutionalist President leading a Conservative movement, (can you say Rand Paul?) or we have an armed revolution. We already have revolution in the streets as it is, but it is in the wrong direction….FOR Federalism instead of for FREEDOM. 2016 will be pivotal…if a Constitutionalist wins, we still have time. If some Statist wins (Hillary) then the collapse will teeter ever closer, and all it will take to go nationwide is one incident like Ferguson to initiate the collapse. 11/10 Had to click a link to find income tax % versus wealth %, took 10 minute at the fridge to realize that the income tax does not encompass the entirety of our stupid tax code. I now want to hire an economist just to chat with him. Thanks for the depressing comment, Zorba! I do pretty much agree with you, but when I see it put in words like that I am simultaneously saddened, angered, and hopeful. I know there are more people like myself willing to fight and work for American freedom via the constitution. Maybe the big money collapse (??) of around October (??) this year (??) will be the catalyst for action, an action we never thought possible again. It always seems darkest before the dawn, and I routinely must get away from the news on the internet and be out in the sunshine lest I go insane. Hopeful but realistic… at least I know how to grow food, can it, build with wood, and the basics of electrical and plumbing. If I survive the collapse, I believe my skill set will be valuable. What is a “fair share” indeed? Even with a completely flat tax, the most successful, i.e. the most productive per capita people, will be paying the most tax. It won’t be the top 3% paying half the tax, it may be the top 13%, or some other small percent paying it. Does a CEO earning one hundred times the low wage use (or for that matter need) one hundred times more roads, fire stations, police, or schools? Even a flat tax is distortionary in terms of individual freedom economics. Of course, much less so than the current progressive system. In practical terms, the progressives, having driven the rich into the Laffer boundaries, will get what they deserve: VAT. There are simply too few cows left to effectively milk for progressives to get all the “free” government goodies they want. So VAT is what they’ll get, just like in Europe, their model continent. … will be that we will all be saddled with sub par growth that cannot even match half the world average. Just like Europe, our new model continent. Subpar growth that will steadily but constantly and relentlessly compound our world prosperity rankings down towards the middle income countries. That will be the central theme of the progressive revolution. As Americans culturally converge to the standard mindset of the average worldwide voter, so will his/her prosperity. There is simply no way around that if you are a realist. Successful and forward looking people should take this trajectory into account and make plans ahead. As the compounding slow growth decline takes hold, it will become increasingly difficult to escape. Tell me where Mitchell Island is, and I’ll sail to it. P.S. Actually there is a Mitchell Island by Vancouver BC but I doubt they follow Dan Mitchell economics. Looks like there’s a Mitchell island in Texas too.